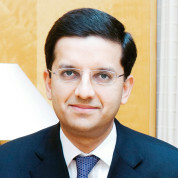 Dixit Joshi is a Managing Director and Head of Equities for Asia Pacific at Deutsche Bank, based in Hong Kong. His role includes strategic leadership of the Equity business including Research, Sales, Trading, Capital Markets and Structuring. Mr. Joshi joined Deutsche Bank in October 2010 from Barclays Capital to head the EMEA Equities business across Sales, Trading, Research and Structuring. At Barclays Capital, he was responsible for the EMEA equity business, had overseen the Asian Equities business, was the Head of Equity-Linked Products and led the growth of the Equity Derivatives business. Before joining Barclays Capital in November 2003, Mr. Joshi spent eight years at Credit Suisse First Boston. He held various roles including Managing Director and Head of Equity Index Arbitrage and Quantitative Trading for Europe and Asia, Chief Risk Officer for CSFB’s Equity Derivatives and Convertibles Unit, based in New York, and before that Head of Equity Derivatives Exotic Trading, based in London. He has served twice as a board member of the International Swaps and Derivatives Association (ISDA), among the world’s largest financial trade associations, and was an Equities Board Member of the Association for Financial Markets in Europe (AFME). Mr. Joshi holds a degree in Statistics and Actuarial Science from the University of the Witwatersrand in South Africa.